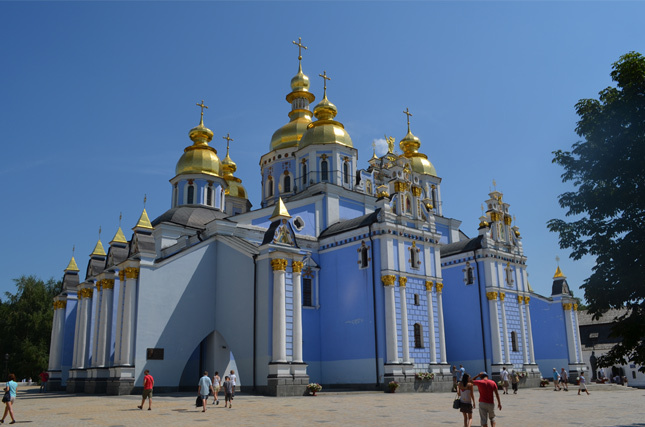 Golden-Domed Monastery in Kiev - one of the most beautiful orthodox churches. St.Michael's church in Kiev - rebuilt after total demolishion in the 1930th. 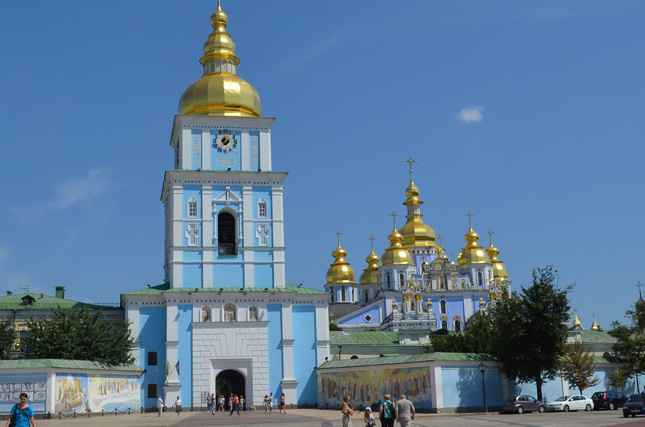 St. Michael's Golden-Domed Monastery in Kiev is a famous and historical site and one of the oldest monasteries in the world. It attracts tourists from around the world because of its beautiful architecture, amazing decoration and interesting history. Even though it was built in the 12th century yet it continues to function as an active monastery. According to some historians, it is believed to be the very first monastery with golden dome. It, in fact, set a trend and later other churches, cathedrals and monasteries also covered the surface of their domes with a layer of gold. St. Michael's Golden-Domed Monastery is surrounded by some interesting places. It overlooks the Podil district that is a historic neighborhood and an administrative district. The Dnieper river can also be seen from Volodymyrska Hirka Park which is near the monastery. St. Sophia Cathedral, another historical landmark, is also situated very close to the monastery. It is believed that this monastery was commissioned by Prince Sviatopolk II Iziaslavych in 1108-1113. It was then dedicated to Michael the Archangel who was his patron saint and was considered a patron of warriors and victories. The Soviets wanted to demolish the original cathedral in the 1930s. Hence, questions and concerns were raised by various Soviet publications to justify the historical facts and the age of the monastery. According to them, the cathedral was heavily reconstructed and the original Byzantine-style cathedral was not preserved, so it does not belong to valuable historical monuments. Local historians and architects were even though reluctant, but they agreed that the monastery should be demolished. The Soviets wanted to demolish the monastery, because they wanted to build a new administrative centre there. However, only the Soviet Empire-style Ministry of Foreign Affairs could be constructed there which is adjacent to the monastery. In 1934, the process of removing the 12th century Byzantine mosaics began. This work was carried out hurriedly before the demolition. Even though complete attention was paid, but most of the relocated mosaics couldn’t be considered as genuine. The remaining mosaics, covering around 485 sq ft, were sent to the State Hermitage Museum of Russia, the Tretyakov Gallery and the State Russian Museum. Some of them were installed on the 2nd floor of the St. Sophia Cathedral for preservation. During the World War II, the Nazis forcefully took some items from Kiev to Germany. Americans later took possession of those items and eventually sent them to Moscow. After Ukraine regained independence from the Soviet Union in 1991, the demolition of the monastery was considered to be a severe crime. 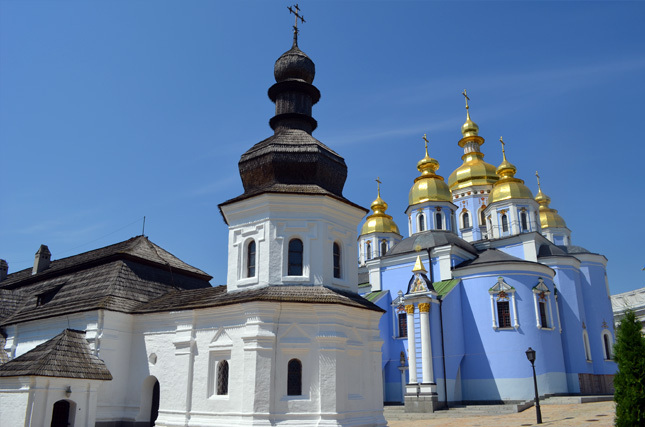 To preserve the cultural heritage of the Ukrainian people, they demanded a complete reconstruction of the monastery. The plan was approved and the work began in 1997-1998. However, during excavations, before reconstruction began, over 260 precious antique artifacts were found. Plus, a section of the ancient cathedral was also discovered and it was completely intact.